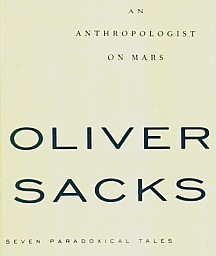 Someone familiar with Sacks' previous books would naturally expect the title words to be used by Oliver Sacks to refer to himself. In the last of the seven stories we discover that the title words were used by Temple Grandin to refer to herself. She is a functional autistic with a Ph.D. in animal husbandry, teaches animal science at Colorado State University, and is a world-renown expert on the building of humane slaughter facilities at meat packing plants. With a level of visual hallucinatory prowess unmatched except by Nikola Tesla, she is able to construct large mechanical animal handling facilities in her mind, test them, improve them, and then draw detailed blueprints of them from memory. As an autistic person living in a non-autistic world, she feels like "an anthropologist on Mars." 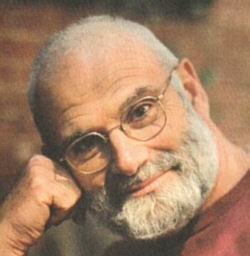 One may wonder if Sacks has any normal friends (or needs any) as he introduces us to the color-blind painter, the stuck-in-the-1950's hippy, the surgeon with Tourette's Syndrome, the artist who paints from memory only his childhood village, the capable blind man who becomes handicapped by recovering his sight, and the autistic child who draws detailed architectural drawings of building exteriors after a brief glance at them. Sacks seems to be an anthropologist in the world of the strange. He is a neurologist, and neurology uncovers the hidden functions of the normal brain by studying the effects of brain malfunctions in otherwise normal people. Once an abnormality is carefully described, a post mortem of the brain and nervous system may pinpoint the regions associated with the defect. Once identified, treatments of similar malfunctions may be generated -- this goal is at the root of Sacks's interest in the special person whose stories comprise this book. My interest is based on a theory, one that I have had for some time, i.e., that if any one person has a particular capability, we all have that same capability, and we are using it all the time out of our awareness. Thus this book offers striking views of the terra incognito of our innermost selves. As you begin this book, might I suggest that you get yourself a window seat for a better view.